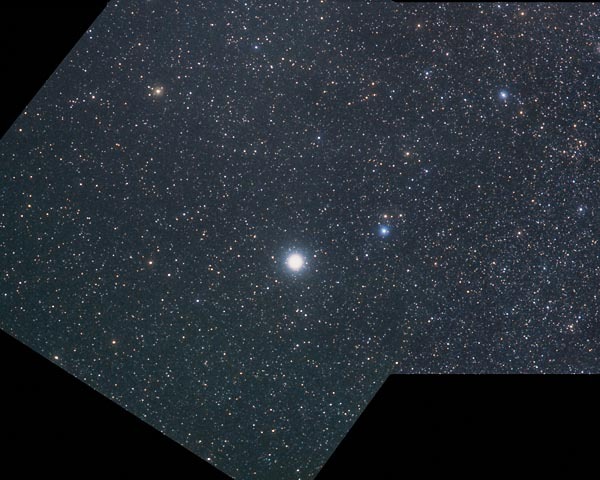 In the picture above, north is at top right and the image covers 21.6 x 27.0 degrees. Image centre is located at 07:40:14.0, +6:16:47 (H:M:S, D:M:S, J2000) Astrometric data from Astrometry.net. Canis Minor (the Lesser Dog) is sometimes regarded as the smaller of the two dogs of Orion the hunter. It is minor indeed, just 185 degrees square, and 71st in size of the 88 modern constellations. The most obvious and interesting object Canis Minor is its principal star, the pale yellow Procyon. Its name is from the Greek, meaning 'before the dog', since it rises before the Sirius, the Dog Star. The named stars in Canis Minor are Procyon (α Canis Majoris) and Gomeisa (β Canis Majoris). The image above was made by combining two photographs where the constellation appeared incomplete in the corners of both. It is still incomplete, however it can be seen whole, but at a smaller scale, on the page for Monoceros.